Born in Turks and Caicos, lives in New York. 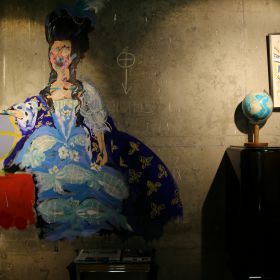 His emblematic subjects painted in vibrant colour have become his signature style, seen in the streets of major cities such as new york, London, Los Angeles, Oslo and Paris. Bradley Theodore creates works which fusion street art, fashion, music and technology. Seven years as a digital creation consultant familiarised him with the American sub-cultures and gave him a unstructured vision of life in general. In New York he is often compared with Jean-Michel Basquiat for his unique street-style. Just like Basquiat, the value of his art works began to increase as an increasing number of art collectors and celebrities started to buy up his work.